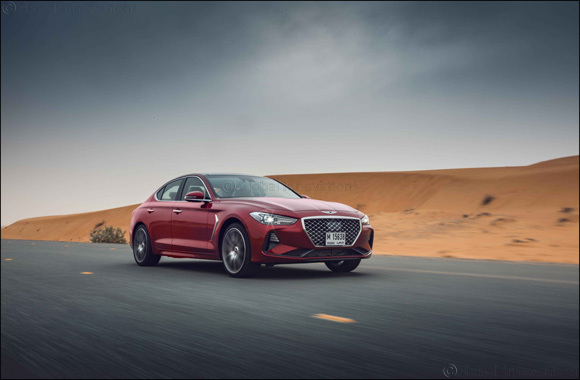 Dubai, UAE, April 16, 2018: Genesis has officially launched its compact G70 luxury sedan in Middle East markets, completing the ambitious brand's core sedan line-up. Engineered as a dynamic car with strong appeal to younger customers and more enthusiastic drivers, the G70 joins the flagship G90 large sedan and mid-sized G80 and G80 Sport, once again demonstrating the commitment to excellence and authenticity that underpins the world's newest luxury auto brand. The Genesis G70 is the latest representation of the brand's rapidly evolving DNA, with its graceful and dynamic exterior styling, elegant and intuitively designed interior, and choice of two different powertrains: turbocharged 3.3-liter petrol V6 and 2.0-liter turbocharged petrol I4. The arrival of the Genesis G70 in showrooms follows a previous display presentation at the Dubai International Motor Show in November 2017, where Genesis fielded a large number of enquiries about the car. With larger G80 and G90 models already growing a strong base of loyal customers, it is expected the compact model will add significantly to the brand's appeal in the competitive Middle East luxury car market. The all-new G70 showcases the future direction of the Genesis brand's ‘Athletic Elegance' design identity. This visual philosophy is represented in the exterior styling, capturing the essence of the Genesis DNA to bring to reality a superbly crafted sports sedan. The long hood and short front overhang, elegant roofline and assertive multi-spoke alloy wheels combine to form a sleek, dynamic profile, subtly highlighted by chrome aero trim, hockey stick daylight opening and parabolic sidelines. From the front and side, the prominent crest-type grille, character lines extending from the hood emblem, and pronounced air intakes, communicate muscular performance. Two distinctive linear LED DRLs on each side of the large crest grille foreshadow the future Genesis signature quad lamps. In the rear, the LED rear combination lamps continue the quad lamp theme, while the raised trunk lid and compact bumper designs give the G70 a poised character. The rear lamps, evolved from the G80, have been stretched to convey a dynamic stance. The G70's interior is configured to prioritize an excellent user experience, with superb fit and finish throughout. The interior packaging reflects simplicity, with an emphasis on genuine functionality instead of gimmickry. A horizontal layout brings a sense of stability, with intuitively laid out switchgear and a comfortable, assertive sport steering wheel. The G70 offers two powertrains in the Middle East region – a 3.3-liter V6 petrol turbo and 2.0-liter I4 petrol turbo. The Lambda II 3.3-liter V6 turbo GDI engine is the heart of the enthusiast-focused G70 Sport, with 370 ps and maximum torque of 52.0 kg.m (510 N.m) 0 to 100 km/h acceleration in 4.7 seconds, and a top speed of 270 km/h. Variable-ratio steering and electronically controlled suspension provide agile steering response and an optimal ride-and-handling experience. The G70 2.0 turbo petrol model is equipped with the Theta-II 2.0-liter turbo GDI engine, with 252 ps and maximum torque of 36.0 kg.m (353 N.m). Mechanical limited slip differential (M-LSD) for improved handling control, power drift and traction performance. The seat positions have been adjusted to lower the center of gravity of the car to maximize performance. To augment the driving experience, the Active Sound Design (ASD) system creates an aural character that reflects the engine load and driving mode settings. Following the lead of the G90 and G80, the G70 offers the most comprehensive levels of safety in its class. Overall body stiffness and rigidity have been dramatically strengthened, while passengers are protected by seven airbags. An unparalleled suite of advanced driver assist systems is integrated into the ‘Genesis Active Safety Control' package to offer the highest level of safety and convenience in its class. These include Forward Collision-Avoidance Assist (FCA), Blind spot Collision Warning (BCW) and Driver Awareness Warning (DAW). The FCA system also automatically activates emergency braking through integrated radar-camera sensors. The G70 incorporates a diverse range of advanced technologies that deliver ultimate convenience and connectivity. Advanced convenience and connectivity features include an 8-inch touch screen display supporting MirrorLink, Apple CarPlay and Android Auto. For the best audio performance, a 15-speaker Lexicon surround-sound system is available to provide an audiophile-level acoustic experience.